Compatible with WPML, WooCommerce 2.5, WooCommerce 2.4.x, WooCommerce 2.3.x, WooCommerce 2.2.x, WooCommerce 2.1.x, WooCommerce 2.0.x, WooCommerce 1.6.x, Visual Composer 4.11.2.1, Visual Composer 4.9.x, Visual Composer 4.9, Visual Composer 4.8.x, Visual Composer 4.7.4, Bootstrap 3.x. Waxom has been tested with browsers IE10, IE11, Firefox, Safari, Opera, Chrome, Edge. 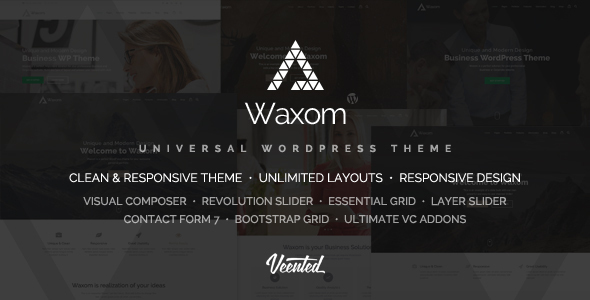 Theme Waxom - Clean & Universal WordPress Theme has the following features: Single mouse click pre-built Demo Sites., Tailored drag u0026 drop page builder., Save over $119 with premium plugins!